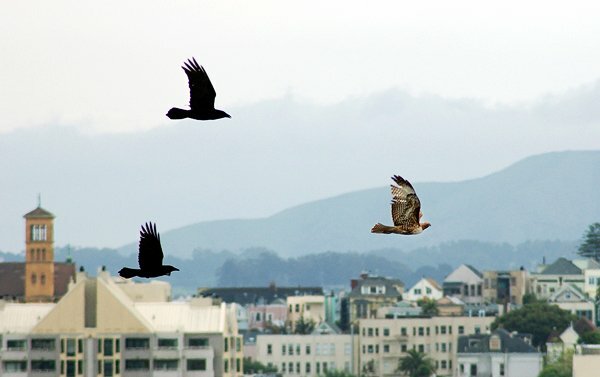 The city can be a tough place to make a living but San Francisco offers raptors a number of parks, small and large, for them to thrive in. But the parks have edges, hard edges, and the hawks have to handle the transitions. Above, Patch the Red-tailed Hawk perches on the urban version of a snag. I can’t quite imagine what the wilderness version of an electrical transformer would be. 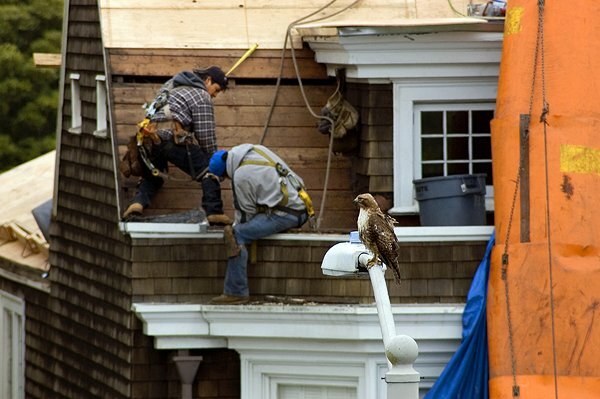 Are contractors the urban equivalent of woodpeckers? At any rate, she didn’t seem disturbed at all. 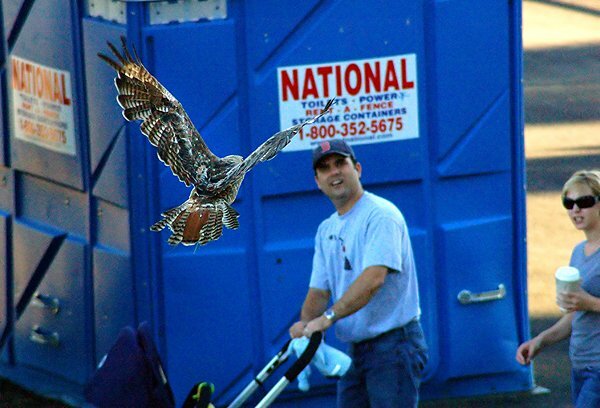 I was always surprised by the strange intersections between this wild raptor and the trappings of humankind. She understood the threat of large ravens, and yet would fly three feet off the ground through intersections. Sometimes her instinctual assumptions were dangerously wrong and yet she survived. Here Patch sits on a bench watching a pocket gopher tidy up the front of its burrow. 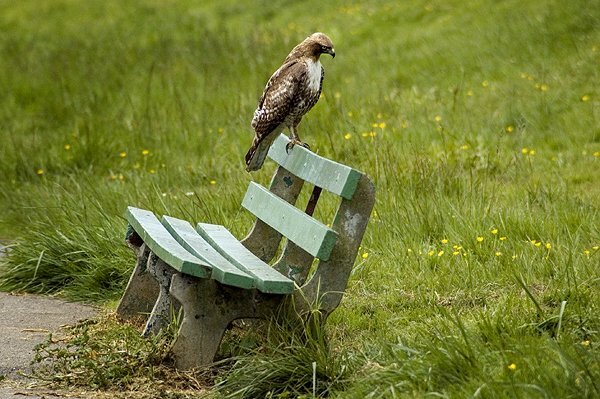 You can get a sense of the hawk’s scale by imagining yourself seated beside her. 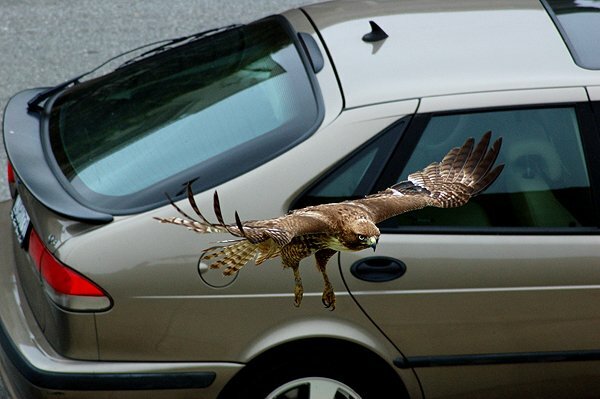 Navigating traffic is another challenge of city living for hawks and people. Patch was often focused on her prey to the possible detriment of her safety but quick reflexes and the ability to fly got her out of tricky situations. Another strange encounter. Here she is carrying a squirming gopher over the heads of park-goers who actually notice the spectacle. I can’t tell you the number of times I’ve seen people walk under a tree branch with a Red-tailed Hawk two feet over their heads and not notice a thing. It always made me wonder how many close encounters I’d missed. A lot of nature photographers try to exclude human made elements but I think the porta potty kind of makes the photo. Patch didn’t just deal with people and cars. Ever present Brewer’s Blackbirds and Common Ravens interrupted her mellow park-side life by mobbing her whenever she got too close for comfort. 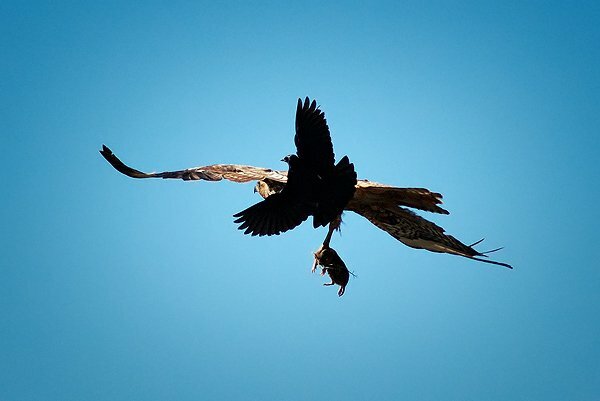 On this occasion, she successfully snatched up a gopher too close to the blackbird nesting colony and got escorted away with the prey still firmly in her grasp. The blackbirds had good reason to be cautious. I’ve seen her dive into their nesting area and emerge with a fledgling. The resulting chase had the blackbirds diving headlong into her tail in a failed attempt to get her to release her prey. More on her hunting techniques and some documented cases of her cacheing food in Part 3 on Friday December 2nd. Walter Kitundu is an artist and designer, instrument builder and bird photographer. As an artist he has created hand built record players powered by the wind and rain, fire and earthquakes, birds, light, and the force of ocean waves. Walter has performed and been in residence at art centers and science museums internationally. He has performed with the renowned Kronos Quartet, bassist Meshell Ndegeocello, the electronic music duo Matmos, and the legendary Marshall Allen - in venues from Carnegie Hall to a high school library in Egilstaadir, Iceland. In 2008 Walter became a MacArthur Fellow. Walter loves photographing birds and is an ongoing volunteer with the Golden Gate Raptor Observatory. 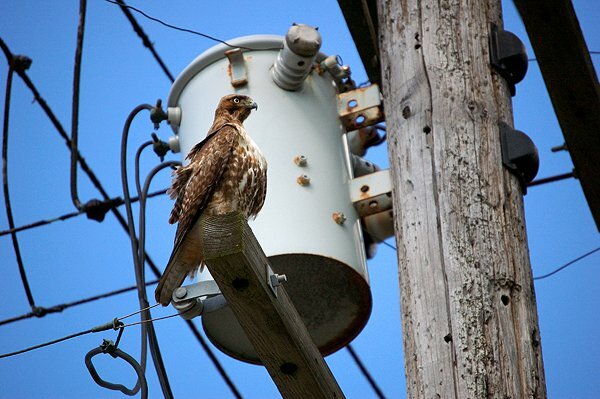 He was hooked when a Red-tailed Hawk landed at his side, ate a caterpillar, then refused to leave. He is a Senior Design Developer for the Studio Gallery at the Exploratorium in San Francisco where he designs and builds environments for learning. You can see more of his work on his blog, Bird Light Wind. I think red-tail hawks are one of my favorite raptors and your photos capture them in all their awesome, statuesque beauty. Wonderful post! I love your photos Walter, and am so happy to have found your blog as well. As a fellow birder I very much appreciate your take on their actions and. BTW, yesterday we hit a gold mine when we walked along the path behind Nordstrom’s in Corte Madera finding LOTS of shorebirds, 18 species in half an hour with the best being the White Tailed Kite, a resident I believe. It looks like my previous note didn’t go though, perhaps I hit the wrong button. But to reiterate, I love your photos and am happy to have found your Friday blogs. I appreciate your take on the birds and their habits, it’s nice to know someone enjoying them and writing about it. Waiting expectantly for Part 3! Thank you for this gift! Incredible series, loving it. Sandy, that area of Corte Madera is a gem. I’ve taken some of my best shorebird photos there. You can have proximity without disturbing the birds one iota. The setting is so unlikely, though, isn’t it? But that’s what’s so awesome about the Bay Area. Ingrid, glad you appreciate that spot in Corte Madera. Our question is regarding tides since I believe that place is governed by man made locks. Wish we could read the regular tidetable to determine the best time to see birds but it doesn’t work that way, any suggestions? Have seen the red tails sitting on parking lot lights at local air force base. Where Are You Birding This Third Weekend of November 2011? Newt Gingrich Lies – About Birds!